I have always liked that journalistic convention … on how to handle a “dateline” when traveling via water. You write “aboard” and continue with the name of the ship. Such as “the USS Enterprise” or “HMS Victory” or “RMS Titanic”. A few decades ago, the dateline also would have included the day a story was filed. (Hence, the expression “dateline”.) This was back when international news moved via ships. S-l-o-w-l-y. So, the waterborne story would start like this: “Aboard the USS Missouri, September 2, 1945″. 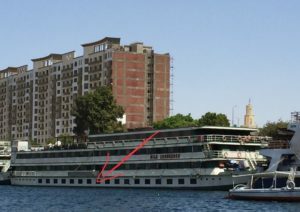 For a week, here, we are living on the Nile River, on a boat named the Nile Commodore. Sounds fancy, but the Nile Commodore ain’t the brightest or biggest or handsomest ship on the river. 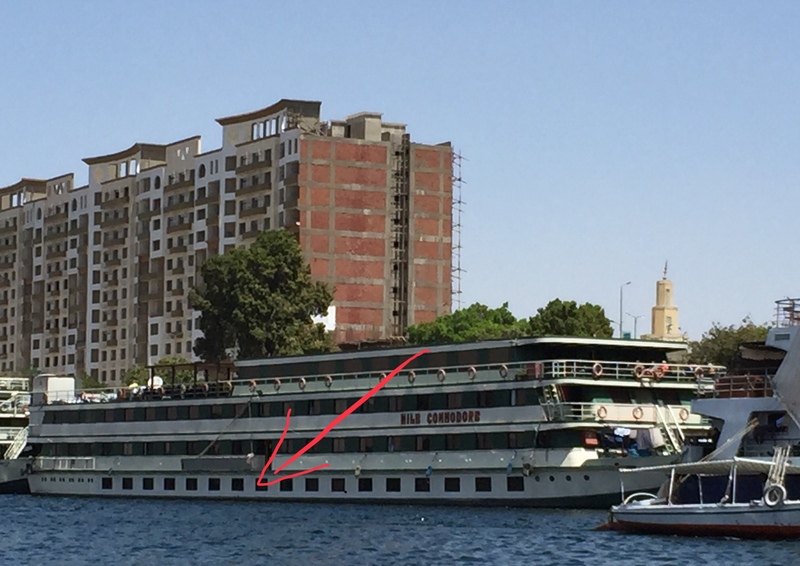 That is a photo of the Nile Commodore, above, with the arrow (photo, above) pointing to our room. The Commodore looks a bit tatty, as the Brits would say. Appearances suggest it may have been on the Nile a good long time now; I think the boat is mostly green, but at other times it looks too drab to rise to a particular color. This boat may fetch back to when Nasser was president of Egypt — or even when Hercule Poirot/Peter Ustinov was solving a mystery on Agatha Christie’s Death on the Nile. The Commodore is at least one deck shorter than nearly all its sister ships on the Nile, and there are many of them. Passenger berths on the bottom deck, which has windows that do not open. (Don’t want to be in the Nile.) More berths on the second deck, but it also serves as the administrative center of the ship. Entrance, exit, manager behind a hotel-style desk with room keys and a cash drawer. And a gift shop. Then up to the third level, best known for the dining room, but also home to some passenger berths with better views. And, at the top, a capacious bar-lounge of soft, leather chairs and dance floor — with deck chairs laid out on a smallish front deck and longer “sun beds” taking up a bigger space on the back deck, along with a plunge pool a ping-pong table and a handful of shaded tables with chairs. And that is all of the Commodore. Whenever we tie up on the shore, all our neighbors seem to be at least another deck higher. Leads to deck envy, I suppose. Which is a long way to get to what I considered the most significant event of the day: A live broadcast of the English Premier League match between Liverpool and Tottenham. It would be shown on “the big screen” according to a shipmate, an Englishman with a dry sense of humor. When pressed on the location of the “big screen” he conceded he was talking about the TV in a corner of the bar-lounge. “It’s the biggest screen on this boat,” he said. It was no surprise when the big screen was not showing us Anfield at 5:30 because Egypt is known by its own citizens for running at “Egypt time” — usually several minutes behind what clocks would suggest. But then our helpful porter said he would fetch “the card” to make the screen come to life. We missed the first 20 minutes — and a goal — before the card was found and installed. The viewers included mostly Liverpool fans, which includes nearly all Egyptians, at the moment, given that prolific scorer Mohamed Saleh, the greatest player in Africa, is a striker for the Liverpudlians. At least one woman was pulling for Liverpool based on her expressed admiration of Jurgen Klopp, Liverpool’s coach. Several others were neutrals and one, a young man from Saudi Arabia who is on the cruise to be the chaperone to his sister, was a dedicated Tottenham fan. As we have noted in posts past, big soccer games seem to reach a wide cross-section of humanity. and some lively banter and sledging commenced, most of it aimed at the enthusiastic young Saudi, a good sport and long-suffering Totenham fan, who would have been happy with a draw, on Liverpool’s ground. Liverpool, however, is trying to keep pace with the streaking Manchester City club, and a draw likely would leave the former three points “adrift” (as Brits would say) of City three days hence tomorrow night — a death sentence, practically, with a half-dozen games to play. A few beers were handed out, and the game proceeded apace (though we missed several minutes of the early second half; technical issues with the Big Screen), and Tottenham pulled even, only for Liverpool to get the winner in the 90th minute, when a sloppy save by Hugo Lloris came to the edge of the 6-yard box and struck the leg of the unsuspecting Spurs defender Toby Alderweireld and caromed into the net. Liverpool wins! The chance of a first Premier League championship lives on! Sitting around waiting for soccer was not all we did during the day. We are in the south of Egypt, and our guide took us to the Aswan High Dam which is, in fact, quite high (biggest in the world) and helps regulate the Nile. Then we took a wretched little boat over to the island of Philae, where some interesting ruins stand, after having been moved above the new lake. A temple to Isis (the goddess, not the terrorists) being the most interesting. We came back to the Commodore via felucca, a one-sail boat that got up a good pace before banging into the sea wall and tying up a few feet from where the Commodore floats in splendor. Or something quite a bit less. Two more days … “Aboard the Nile Commodore” … lie ahead.